Storefront Mega Menus allows you to create enhanced full-width dropdowns that seamlessly integrate with your Storefront-powered WooCommerce shop. Go to: WordPress Admin > Plugins > Add New to upload the file you downloaded. More information at: Managing and Installing Plugins. 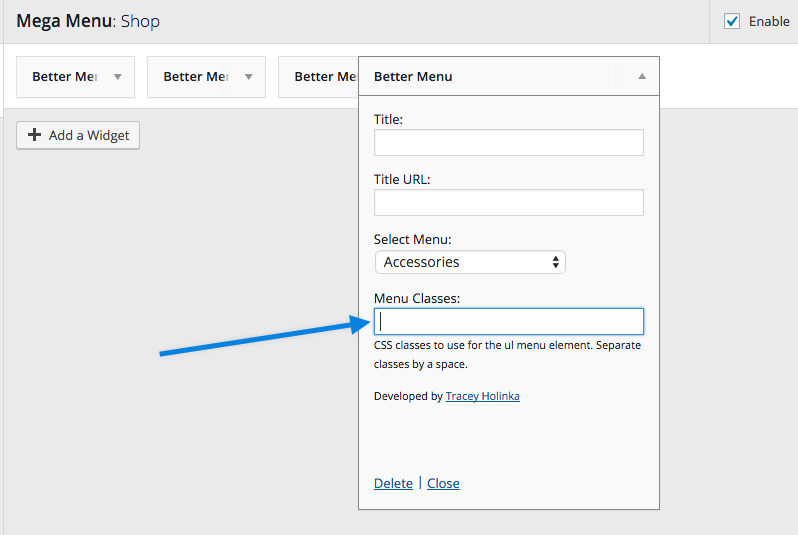 Storefront Mega Menus adds all its settings to WordPress Customizer, making it straightforward to use. Upon opening the Customizer at Appearance > Customize, navigate to Menus. The Menu Customizer, introduced in WordPress 4.3, allows you to intuitively manage the site’s menus. In this section are several settings. Currently, Mega Menus only works in the Primary Menu location, which is the main navigation under your logo. Click the Add Items button and select items you would like to add to your Menu. Click the arrow next to the title of one of your Menu Items to display the Mega Menu button. The Mega Menu button opens a new side panel where you can manage the selected Menu Item. Click the Add a Widget button to add a new widget. Select a widget from the list. Note that if a Text Widget is used, then shortcodes included in WooCommerce can be applied. With your mouse, hover over the corner/borders, then click and drag to resize the widget. Click and drag the top of a widget to move it to a different position. Click the arrow next to the widget title to display options. At the bottom select Delete. When the Enable checkbox is ticked, the Mega Menus are shown on your site and Preview is available. TIP: At the bottom left corner of your screen, look for the Collapse button. Use this button to hide all Customizer panels and see a full Preview of your site. Frequently asked questions about Storefront Mega Menus. To link the widget title of the custom menu when creating Mega Menus we recommend that you use a plugin titled Better Menu Widget which allows for this instead of the default WordPress Custom Menu Widget. When using this widget remove the default text of sub-menu from the widgets menu classes section leaving this field blank like the screenshot below.